UCLU have put out a press release about the situation at Hawkridge House. Here is the full text and pictures from the site. 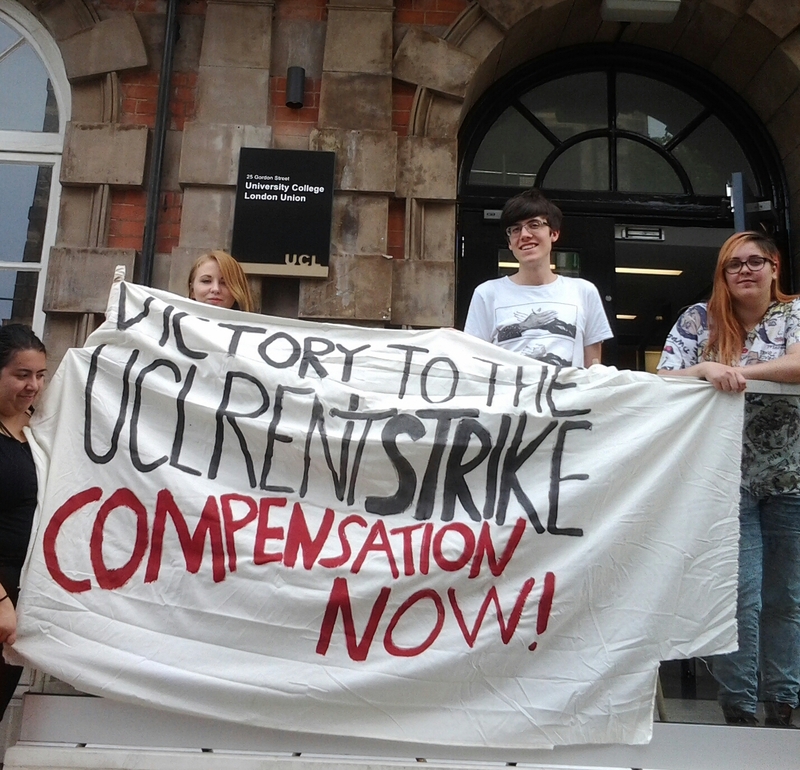 Solidarity with students at Hawkridge in their struggle for respect and dignity from UCL! As exams approach, over 230 students at UCL’s Hawkridge House in Chalk Farm are determined to force their College to end disruptive constructions works and pay compensation by withholding rent. More than half of all residents have already written to UCL demanding a refund and the students’ union is pushing management to fully comply with students’ requirements as patience runs low. Since February, residents at Hawkridge, predominately overseas postgraduate students, have seen their homes transformed into a construction site as UCL – who charge £132.20 per week for a single room – erected scaffolding on all sides of their 14-story tower block . Early morning drilling, dusty rooms and a lack of sunlight and privacy have since been the norm, causing stress and health issues and leaving students unable to revise in their rooms. When rooms were advertised last summer there was no mention of scaffolding or construction and when residents moved in in September where were told that works would be over by January. In their last communication to students, UCL have stated that works could continue until 26 April. The only notice given of planned works before students moved in. A promise broken three months ago. It was only after formal meeting between UCL managers and UCL Union representatives on 27 March that any mitigating measures were taken by the College. However, the management concession to place more desks in the silent study are on site was deemed inadequate by residents and the Union, who are maintaining their demands for an immediate halt to construction works and full compensation for the College’s breech of their contract. Belen Desmaison, a postgraduate student from Peru is asthmatic and has suffered because of dust from constructions and was struck by migraines as a result of not being able to open her window. She said that, “the fact that I have to close my curtains so that construction workers don’t see me sleeping or changing my clothes does not only mean that my view is ruined but that I now live without natural light from Monday to Friday.” She also described drilling noises as “unbearable”. UCL Union is now advising residents to withhold rent payments until there are reliable assurances from UCL that compensation will be paid and that construction will end until the end of exams. For the past five years, UCL has increased the rent in their accommodation by up to 5% per year. A room at Hawkridge House cost £127 in 2013/14, when there was no construction work. Recently, there have been protests by UCL students against planned rent increases, including a flash occupation of the Provost’s balcony. The Union has handed out information about students’ rights in English and Mandarin Chinese.